Ancient grudges, old wounds, and the quest for power rule in the newly widowed Queen Isolde's court. Hardly a generation after the downfall of Camelot, Isolde grieves for her slain husband, King Constantine, a man she secretly knows to have been murdered by the scheming Lord Marche -- the man who has just assumed his title as High King. Though her skills as a healer are renowned throughout the kingdom, in the wake of Con's death, accusations of witchcraft and sorcery threaten her freedom and her ability to bring Marche to justice. Burdened by their suspicion and her own grief, Isolde must conquer the court's distrust and superstition to protect her throne and the future of Britain. One of her few allies is Trystan, a prisoner with a lonely and troubled past. Neither Saxon nor Briton, he is unmoved by the political scheming, rumors, and accusations swirling around the fair queen. Together they escape, and as their companionship turns from friendship to love, they must find a way to prove what they know to be true -- that Marche's deceptions threaten not only their lives but the sovereignty of the British kingdom. 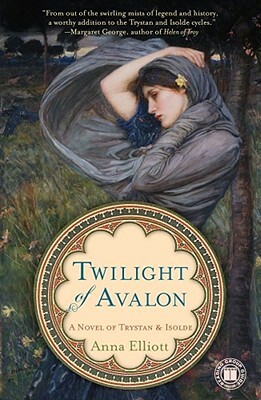 In Twilight of Avalon, Anna Elliott returns to the roots of the legend of Trystan and Isolde to shape a very different story -- one based in the earliest written versions of the Arthurian tales -- a captivating epic brimming with historic authenticity, sweeping romance, and the powerful magic of legend.